The Bureau of Development Services is digging in its heels following an attempted smackdown by brick-and-mortar building owners, who don't want to post city-mandated signs that warn of the risk shaky structures pose during an earthquake. 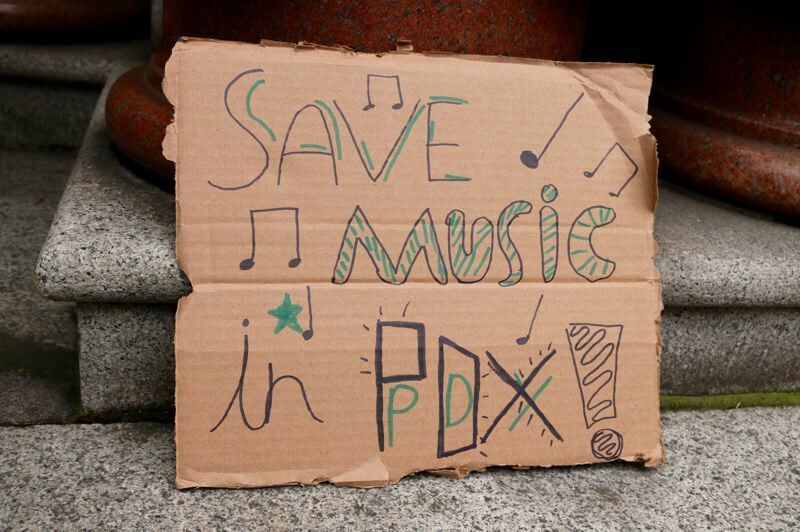 Representatives from the National Association for the Advancement of Colored People and a local musicians guild said the city's unreinforced masonry (URM) rules are a form of racist "redlining" during a demonstration outside Portland City Hall on Saturday, Jan. 5. In particular, critics say the rules create a "lien" or "encumbrance" on their property that will hamper their ability to retrofit the buildings by taking out loans — or sell the properties to anyone who would need bank financing. One speaker, preservationist M.K. Hanson, called the signage required by Ordinance 189201 not "a notification, it's a condemnation." "Mayor Wheeler made a promise to work with owners," she said, "but this title encumbrance breaks that promise." These critics are likely referring to the third part of the ordinance passed Oct. 10, which requires property owners to submit to BDS a declaration of compliance. The document affirms that tenants have been notified of the signs and also puts in writing a pledge not to remove the signage. "The declaration is not a lien and does not compel any retrofitting on the part of the building owner," said Alex Cousins, a spokesman for the bureau, in an emailed statement. "It only serves to document compliance with Ordinance 189201, which aims to create further awareness of the risks posed by URM buildings in Portland." Cousins says the city's database of unreinforced brick buildings has been public record since 1995, and "has been known to building owners, lenders and insurers for over two decades." Development Services and the Portland Bureau of Emergency Management are planning to convene an unreinforced masonry advisory committee this year, which the NAACP and other stakeholders will be specifically invited to join. Added Cousins: "We look forward to working with community members and building owners to make our city safer in the event of a large earthquake."